Final negotiations are underway for three actors to join the cast of Gus van Sant’s Milk, Gus van Sant’s biopic of the slain San Francisco Supervisor and gay rights icon, opposite Sean Penn in the title role. Emile Hirsch (Into the Wild), Josh Brolin (No Country for Old Men), and James Franco (Spider-Man 3) are signing on. The filmmakers are also holding open casting calls in the city. A Towleroad reader sent us this shot of one of the posters hanging in San Francisco. They’re looking for 18-30-year-old men, and they’ll be casting at 325 Sanchez Street between 16th and 17th in the Castro between 10am and 4pm this Saturday! 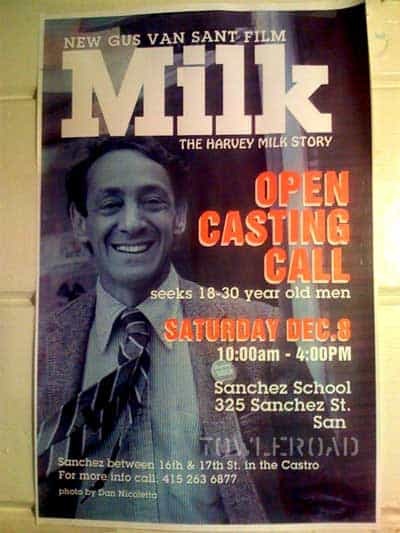 Look for a special bonus Harvey Milk post coming up in just a bit!